Occo Coolers Telford has adapted the T range cooler to produce an air to air heat exchanger, which is compact in size but delivers outstanding cooling performance. 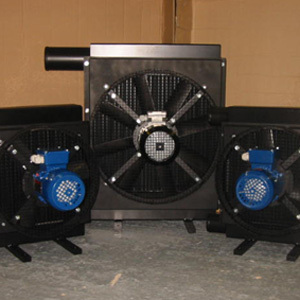 These air blast coolers are available with AC, DC or hydraulic motors which give you the flexibility to choose a cooler to suit your requirements. If our standard range does not meet your requirements, then we can manufacture a bespoke unit that will.